The REAPR pipeline performs computational screens for structural non-coding RNA while revealing even strongly structurally misaligned RNAs. It is the first such pipeline that is sufficiently fast to screen entire eukaryotic genomes. The REAPR pipeline is freely available and licensed under GPL 3.0. We provide online installation instructions (including download links of required software) and documentation. Sebastian Will, Michael Yu, and Bonnie Berger. "Structure-based Whole Genome Realignment Reveals Many Novel Non-coding RNAs." Genome Research, 2013. Please find supplementary information here. The REAPR pipeline consists of three steps: (1) The screened whole genome alignment is sliced into windows. The windows are filtered based on an alignment independent criterion for structural RNA: thermodynamic stability of single RNA structures. The stable windows are merged into stable loci. (2) Each stable locus is realigned based on sequence and structure similarity. This results in a stable locus alignment that correctly aligns RNA structure even when the locus was originally misaligned. (3) A conventional ncRNA predictor is applied to estimate ncRNA likelihood from the corrected locus alignment. 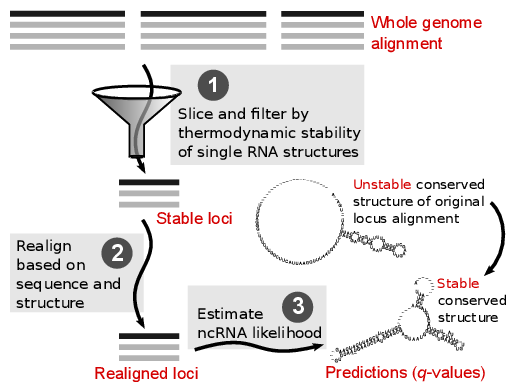 Whereas a locus of true ncRNA shows only unstable conserved structure in the original alignment, if this structure was misaligned in the whole genome alignment, the pipeline can reveal the stable conserved structure of the ncRNA.